BMG. BACK ISSUE. SUMMER 2016. Location: /BMG Magazine/BMG. BACK ISSUE. SUMMER 2016. From a Bath Chair: Richard Ineson. 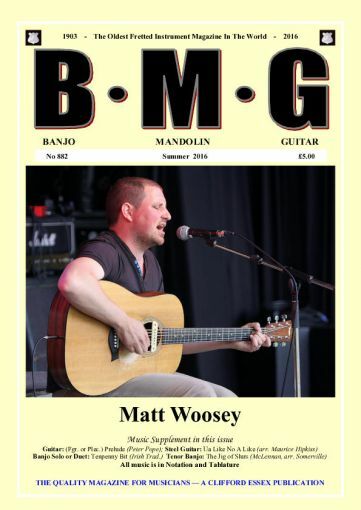 Cover Picture: Matt Woosey: Allan Brace. BMG Tape Club (Hawaiian Guitar Section): John Marsden. The Pedal Steel Guitar: 5: Maurice Hipkiss. Little Cabin Home on the Hill. Plectrum Guitar Technique 4: Mike Chapman. Bluegrass Banjo 22: David Cotton. By the Way / You Pays Your Money: David Wade. Fun with the Ukulele: Ray Woods. Prelude (Guitar, Fgr/Plec): Peter Pope. Ua Like No A Like (Steel Gtr): Arr. Maurice Hipkiss. Tenpenny Bit (Banjo solo/duet): arr. Alan Middleton. Fretted Instruments of the World: The Venetian Experience: David Cotton. Morley Magic: New Albums with Accompaniments and Text. Sony/Legacy’s ‘Orthophonic Joy’: Part 3: Anthony Lis. With a Banjo on my Knee: Alan Middleton. Plectrum Banjo Technique: Ron Hinkle. The Banjo Story: 17: A.P. Sharpe. BMG. BACK ISSUE. SPRING 2016. BMG. BACK ISSUE. AUTUMN 2016.